Squad status: We are currently looking for new players to add to our squad for next season (U15s). We have secured promotion to Division 1 and currently sit at the top of Exeter and District Youth League Division 2. We are a friendly team who enjoy playing together, in a supportive and family-oriented environment. The team is managed by an FA qualified Youth Football Coach. We are looking for experienced and committed players who are ready to take on the challenge of playing in Division 1. If you are interested in getting involved please contact Ag (see details above). United picked up another away win against Whipton Youth on a beautiful but chilly April evening. Usual goalkeeper Lewis Fulls scored two with an impressive outfield performance. Jay Leballeur picked up a hat-trick whilst Cayleb Field and captain Patryk Plachecki scored one each. The final result, 7-1, takes Exmouth one step closer to achieving their ambition of winning Division 2. 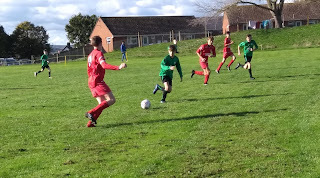 Exmouth United Under 14s made it 15 wins in 16 away to Central City in the Exeter & District Youth League Division 2. The match started evenly but United took the lead when Jay Leballeur converted a penalty after being fouled in the box. Shortly after he grabbed a second when Cayleb Field played a superb left-footed through ball from deep. City then took back the initiative, scoring a penalty and hitting the bar twice during a melee in the Exmouth area. An impressive solo goal from Leballeur completed his hat-trick and made it 3-1 to the visitors at half-time. The second half saw impressive performances from wingers Patryk Plachecki and Daniel Alford. Plachecki was involved in developing a number of attacks on the right wing - demonstrating some great skill and superb crossing. On the left side defender-turned-winger Alford was positive throughout the half and his desire was rewarded when he twice latched on to the ball in the area to score for United. Leballeur grabbed another and the match finished 6-2 to Exmouth. Another commanding demonstration from United puts them in a very strong position at the top of the table with only 4 matches to go. 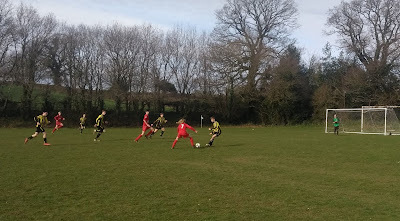 The wind was blusterous as Exmouth United hosted Crediton Youth at Warren View Playing Fields. Indeed the weather made it difficult for either side to get the ball and play. Against the wind, the visitors worked incredibly hard and held out for 30 minutes until a Patryk Plachecki corner fell to centre back Daniel Alford who struck the perfect volley to take the lead. After the break Crediton came on strong, creating a number of chances and bagging an equaliser. They would have taken the lead if not for keeper Lewis Fulls and some great defending from Harry Bassett and Tom Price. Harry Kifli-Reynolds, Cayleb Field and Dylan Mogford fed United left winger Jay Leballeur who began to find space and United turned the momentum to their advantage. First, Harry Bowley arrived in the box to put the reds back in the lead. Then Leballeur followed up with two excellent runs and finishes from the left side. United's centre-mids Lewis Evans and Finn Glanfield bossed the midfield and Bryn Stephens and Seb Harrison were commanding in defence. 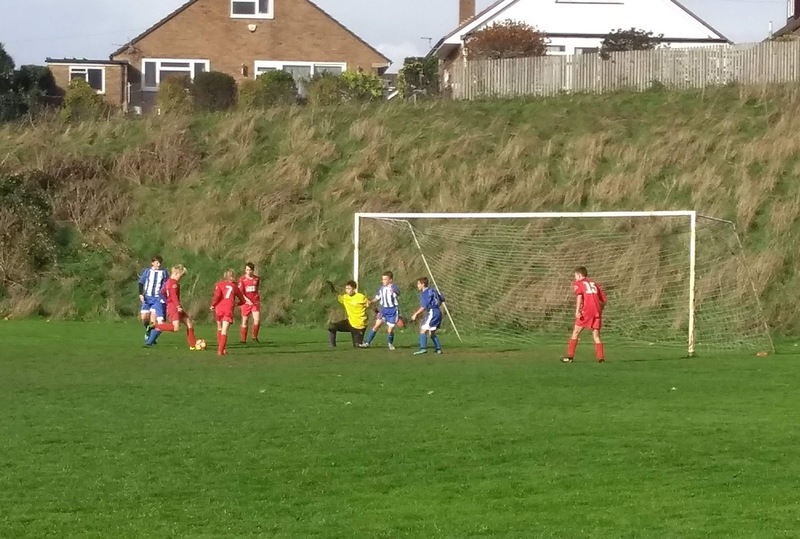 Exmouth United continued their impressive form away to Sidmouth Raiders. The game featured some excellent headed goals, from Harry Bowley and Finn Glanfield of United and two from the Raiders. Bowley scored a second and Cayleb Field bagged another goal from up front. 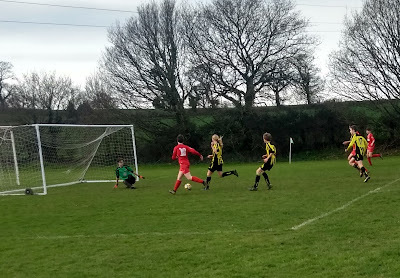 Exmouth United put in another excellent performance against the impressive West Hill Wasps. United had to be patient but played some good football and were rewarded for their efforts with two early goals from Jay Leballeur - the second of which was a wonderful "screamer" from the left of the penalty area. Bryn Stephens takes on the defender to set up an early chance. In the second half United scored two more. First, Seb Harrison set up Finn Glanfield for a pinpoint shot into the corner. Then Bryn Stephens dribbled down the wing to release the ball to Harry Bowley whose cross was met by the head of Cayleb Field to make it 4. Cayleb Field comes close before taking his headed chance in the second half. West Hill showed very good organisation and kept battling to the end when they were rewarded with a goal just before the final whistle. United put in an impressive performance to get back to winning ways against Copplestone Colts. The first half was closely contested but Exmouth shaded it scoring three to the visitors' one. In the second half the home side stepped it up and the match finished 14-2. Strikers Jay Leballeur and Cayleb Field scored 6 and 4 respectively. Tommy Foa, Harry Bassett, Harry Bowley and Lewis Fulls were also on target for the hosts. On a windy morning and muddy pitch Millwey Rise put an end to Exmouth United's 100% league record with a hard-fought win. The home side were on top from the start and built on their advantage by taking a first half lead. After the break Exmouth improved and deserved their equaliser 10 minutes before the end. However, Millwey made it 3 points with a late winner and United were not able to find a response. 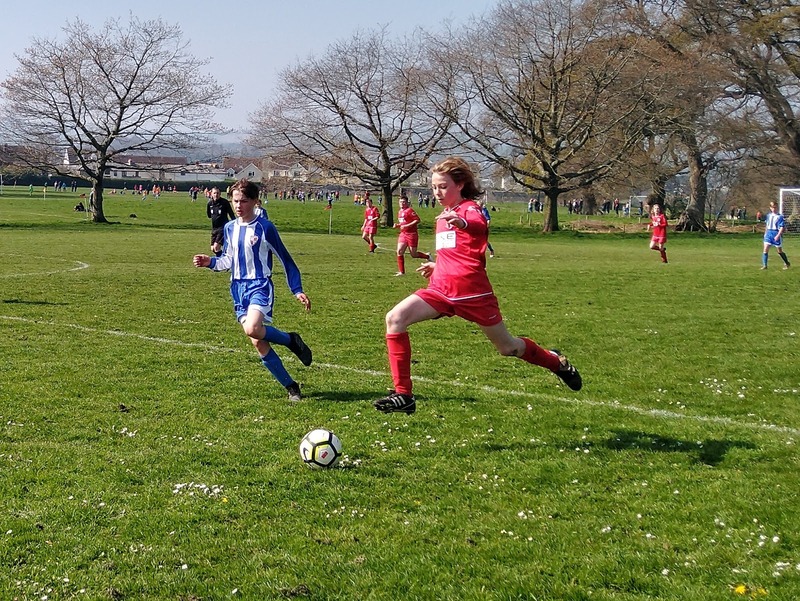 United had to say goodbye to their chances of regaining the Under 14s Plate Trophy when they were beaten 4-0 by the impressive Division 1 outfit Exeter Panthers. Exmouth put in a great first half performance in which they matched the visitors and were unfortunate to go in one down at half-time. Panthers sealed the victory in a 10 minute spell during the second half when they scored 3. Exmouth kept battling throughout and deserved at least a goal for their efforts but were unable to find a way through. Overall it was an excellent contest between two good footballing sides. A fantastic Exmouth United performance saw them make it 10 wins out of 10 in the Exeter & District Under 14s Youth League. The hosts Feniton Fliers pushed United back from the off with their strength and superior passing. 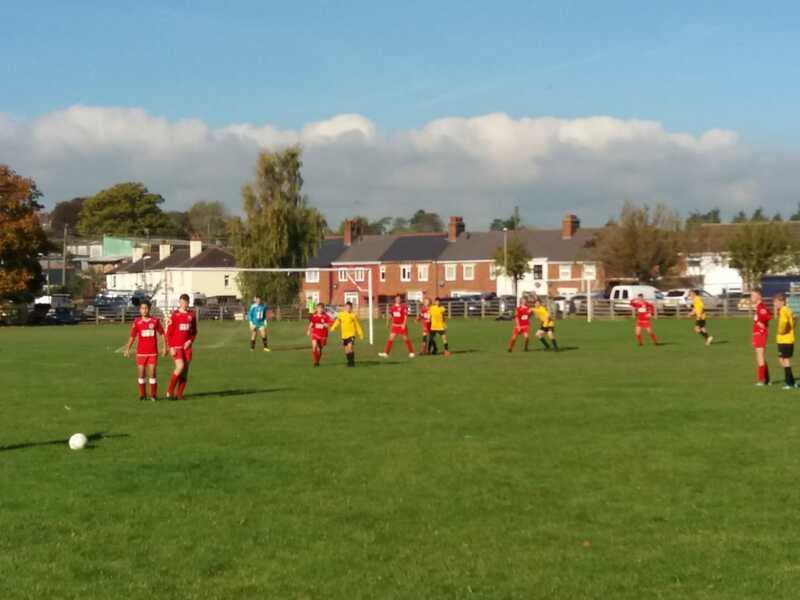 However, Exmouth grew into the game and were rewarded with goals from Cayleb Field and Jay Leballeur, the latter set up by Seb Harrison who was irrepressible in midfield. Fellow midfielder Lewis Evans gained a second assist to set up another for Leballeur and Field grabbed a brace to make it 4-1 at half-time. The attacking prowess was only half the story - with United withstanding pressure superbly at the back. Expert glovesman Lewis Fulls had a commanding game as did defenders Dylan Mogford, Daniel Alford, Tom Price, Harry Bassett, Harry Bowley and captain Harry Kifli-Reynolds. In the second half it remained a very close match. Tommy Foa, Bassett, Harrison and Mogford worked relentlessly in midfield to keep out the home side. Leballeur grabbed a third and at 5-3 the game was finally killed off when Bryn Stephens weaved into the box to set up winger Patryk Plachecki who finished exquisitely at the near post. This hard fought battle in which both teams played some great football - ended 6-3. 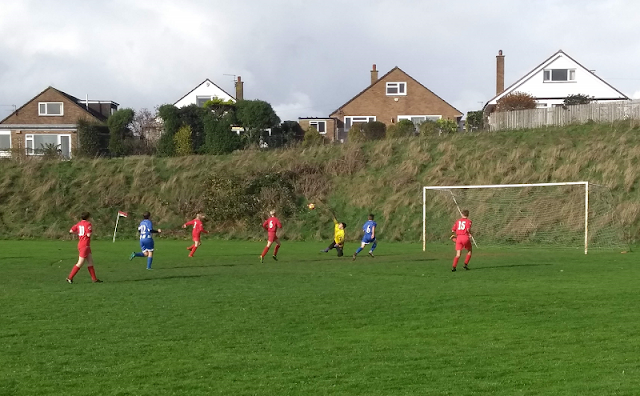 United kept up their good form with a final win of the year at West Hill where they beat the hosts 3-1. Exmouth started well and were creating chances from the start. It was only a matter of time before they broke through and it was the front line of Jay Leballeur and Cayleb Field that put them 2 up at half-time. The home team kept battling and limited the opportunities in the second half. However, Leballeur managed to grab a second with an excellent left-footed strike. West Hill worked hard and were rewarded with a late goal to make it 3-1. United put in an impressive second-half performance against Ottery St Mary in which they scored 7 to win 8-1 and guarantee a place in the quarter finals of the Plate competition. Striker Jay Leballeur hit 3, Daniel Alford and Harry Bowley scored 2 each and Cayleb Field finished it off with an excellent turn and shot. 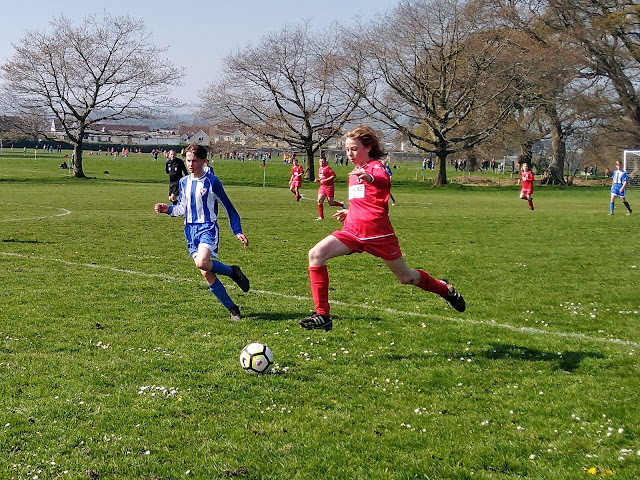 Exmouth United Under 14s put in another commanding performance to beat Central City and make it eight wins from eight so far this season. In-form striker Jay Leballeur got the first of five with a cool finish before being involved in some excellent teamwork to set up Seb Harrison for the second. Leballeur notched up three more by half-time. However, Central could have scored at least once after some impressive runs beat the off-side trap but the strikers were thwarted by the speed and power of the excellent United Glovesman Lewis Fulls. In the second half Lewis Evans and Tommy Foa scored soon after the break and then Evans went on to get a hat-trick. Bryn Stephens chipped the keeper for the tenth goal and Leballeur scored a superb individual goal to make it 11. Stephens chips the keeper for the tenth goal. There were excellent performances in defence from Harry Bassett (captain), Harry Kifli-Reynold, Tom Price, Patryk Plachecki and Finn Glanfield. Some exquisite and unselfish passing from Dylan Mogford and Cayleb Field created numerous chances and Harry Bowley was unlucky not to score after some superb runs. 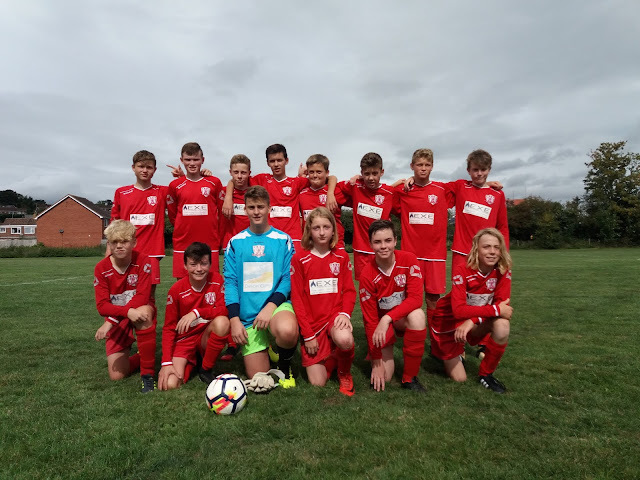 Exmouth United Under 14s put in another commanding performance against Sidmouth Raiders to carry on their winning start to the season. United got off to a fast start when Jay Leballeur scored and then set up Patryk Plachecki for a second. However, the visitors found their feet and were soon back in the match with a well worked goal. In spite of many attempts from both teams it remained 2-1 at half-time. Exmouth's start to the second half was excellent and they soon began a ruthless scoring streak that resulted in three more for Leballeur, two for Cayleb Field and goals for Finn Glanfield, Lewis Fulls, Seb Harrison and Captain Harry Bassett. A very impressive attacking display from a team brimming with confidence. Team: Lewis Fulls, Harry Bassett, Harry Kifli-Reynolds, Cayleb Field, Seb Harrison, Dylan Mogford, Bryn Stephens, Finn Glanfield, Jay Leballeur, Patryk Plachecki, Harry Bowley. 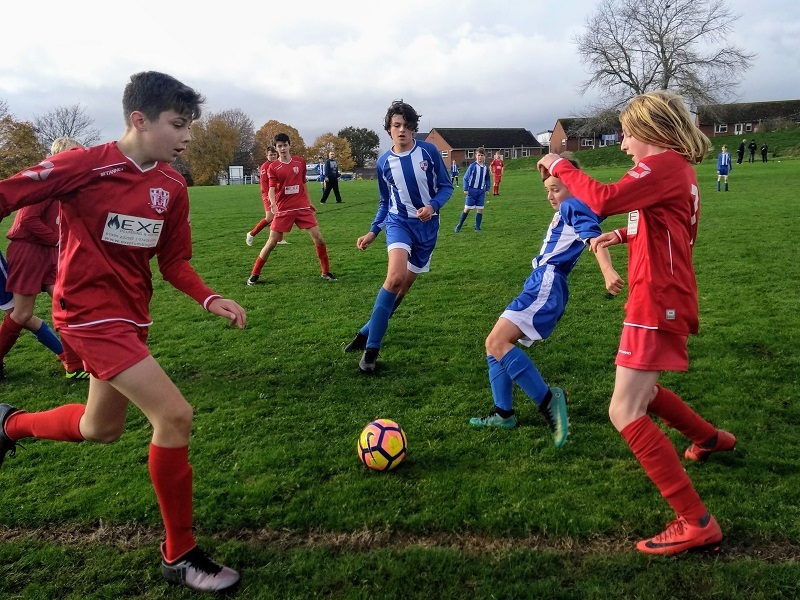 In possibly their toughest encounter this season Exmouth United Under 14s overcame a strong Twyford Spartans side to record their sixth successive victory in the league. Early on United were pegged back by the sustained pressure and superior passing of the hosts but it was the visitors that took the lead when Dylan Mogford's throw released Jay Leballeur who sped down the left wing and finished adeptly. The remainder of the first half was finely balanced and it was all square at 1-1 by half-time. The second half saw a superb change of intensity from Exmouth with a notable contribution from Seb Harrison who caused Twyford all kinds of problems from midfield. He linked up with Leballeur and Cayleb Field in some breathtaking moves that led to goals for both players. Harrison's performance was topped off with a wonderful free kick that flew straight into the net from a tight angle. Spartans were not finished, and eventually they got one back from the penalty spot. It could have been more if it wasn't for the defensive resolve shown by United - led by their excellent captain Daniel Alford and goalkeeper Lewis Fulls. Exmouth had the final word when winger Bryn Stephens slipped past the full-back and chipped the keeper from just inside the box. Team: Lewis Fulls, Harry Bassett, Tom Price, Daniel Alford, Harry Kifli-Reynolds, Cayleb Field, Seb Harrison, Dylan Mogford, Bryn Stephens, Finn Glanfield, Lewis Evans, Jay Leballeur, Patryk Plachecki, Harry Bowley. 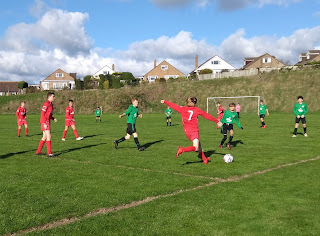 Another excellent team performance by Exmouth United Under 14s earned them a 5-0 victory away to Copplestone Colts. In blustery conditions it was difficult to control the ball but Exmouth were quick to take the initiative when Patryk Plachecki broke through on the left and shot deftly past the keeper. After some great link-up with full-backs Harry Bassett and Harry Bowley it was right winger Lewis Evans who got the second with a blast from inside the box. In the second-half United continued to create chances but it was glovesman Lewis Fulls who was busiest during the first period - his bravery and superb saves keeping the hosts at bay. However, Exmouth gradually over-powered the Colts with their superior passing. First Plachecki bagged his second and then striker Jay Leballeur added two late strikes. The pick of the goals saw United piece together a 10-pass move from goalkeeper through defence, midfield and attack. A thoroughly enjoyable display from Exmouth whose team-play continues to improve. Team: Lewis Fulls, Harry Bassett, Tom Price, Tommy Foa, Daniel Alford, Cayleb Field, Seb Harrison, Dylan Mogford, Bryn Stephens, Finn Glanfield, Lewis Evans, Jay Leballeur, Patryk Plachecki, Harry Bowley. Exmouth United continued their strong start to the season in a rain-soaked match against Millwey Rise. The action began early when midfielder Bryn Stephens played in striker Cayleb Field who was denied by the post. The visitors hit back and were soon ahead when a slick through-ball was converted by their striker. But Exmouth were in the mood to attack and quickly recovered with a masterful solo goal from right winger Jay Leballeur. That set the stage for some great football with left winger Patryk Plachecki involved in the next two goals - an own goal and a second for Leballeur, who turned provider for Field to make it 4-1. United piled on the pressure and midfielder Finn Glanfield made it 5 with a cool finish just before half-time. The home side's organisation in defence - Seb Harrison, Dylan Mogford, Harry Bassett and Harry Kifli-Reynolds - kept the visitors at bay. Harry Bowley was notable for his range of passing from right back. The second-half continued in the same vein and Lewis Fulls switched the ball to Leballeur who sealed his hat-trick. Next it was Mogford who rode a challenge and then struck a superb shot from the edge of the box to beat the keeper. United wrapped it up with a free kick from Lewis Evans after he was brought down just outside the area. Whilst Exmouth's 8-1 victory was spearheaded by the attack it was captain Daniel Alford who made a number of excellent saves in goal to secure a superb win for the home side. United put in a strong performance away to Okehampton Argyle in the cup but experienced their first defeat of the season in a closely fought match. Exmouth equalised in the second half when Patryk Plachecki crossed to Cayleb Field who headed in. However, a late goal by the home side sealed their win. On a beautiful autumnal evening United continued their good start to the season with an impressive victory away to Lympstone. From kick-off Exmouth set out to play passing football and left-back Tom Price led the way with a superb run up the line before being fouled. From the resulting free-kick Cayleb Field launched a powerful cross into the box that found its way into the far corner of the net. Price and Field were involved in the build-up to the second when striker Jay Leballeur made a superb run from the left and slotted the ball past the glovesman. Next Daniel Alford played a pass from defence through to Leballeur who charged through and passed the ball into the net. Next Finn Glanfield latched on to a ball in the box and finished coolly with his left foot. The next goal, the best of the match, stemmed from an awesome passing move that involved Harry Bassett, Seb Harrison, Bryn Stephens, Lewis Evans and ended in another electric finish from Leballeur. In the second-half it was Patryk Plachecki that set the game alight with a Messi-like solo run down the left wing, slipping past two defenders and the keeper before scoring. After a volleyed goal from Lympstone, a Plachecki header was denied by an amazing save before he picked up a rebound to grab a brace. By this point United were confident and dominant. Harry Bowley, Captain Dylan Mogford and Evans were playing the ball around with ease. Leballeur grabbed two late goals to chalk up 5 altogether before finishing the match as Exmouth goalkeeper. The main keeper Lewis Fulls used his fantastic distribution throughout the match and even played a cameo role in midfield late on. 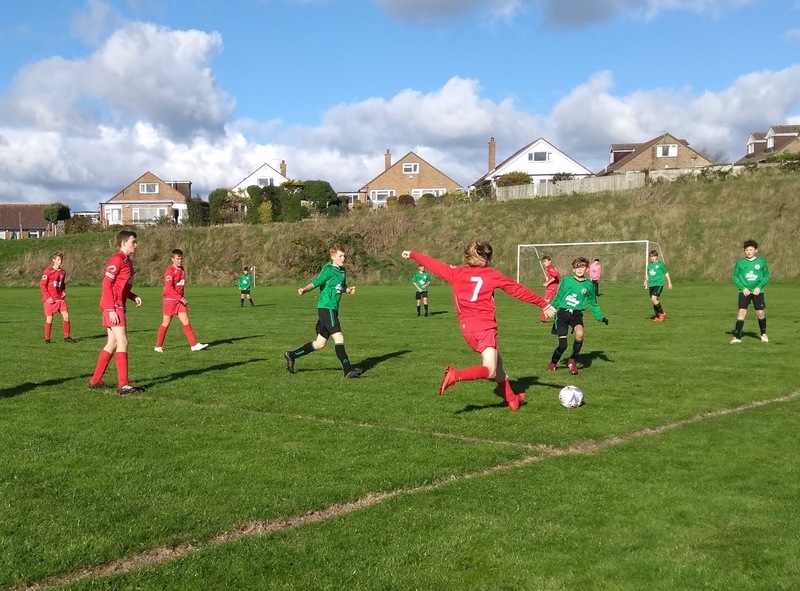 Exmouth United Under 14s continued their unbeaten start to the season with an impressive 2-0 home victory against the excellent Feniton Fliers. After a slow start United found their rhythm and created a number of first half chances. It was a goal kick that led to the breakthrough when new glovesman Lewis Fulls sent the ball long and released lightning striker Jay Leballeur to finish coolly. In the second half the visitors pressed hard but United centre-backs Harry Kifli-Reynolds, Cayleb Field and Seb Harrison held them out. Eventually Exmouth sealed the win with a second assist from Fulls when Leballeur slipped through the defence expertly to get his brace. Team: Lewis Fulls, Harry Bassett, Tom Price, Harry Kifli-Reynolds, Cayleb Field, Seb Harrison, Dylan Mogford, Bryn Stephens, Finn Glanfield, Lewis Evans, Jay Leballeur, Patryk Plachecki, Harry Bowley. 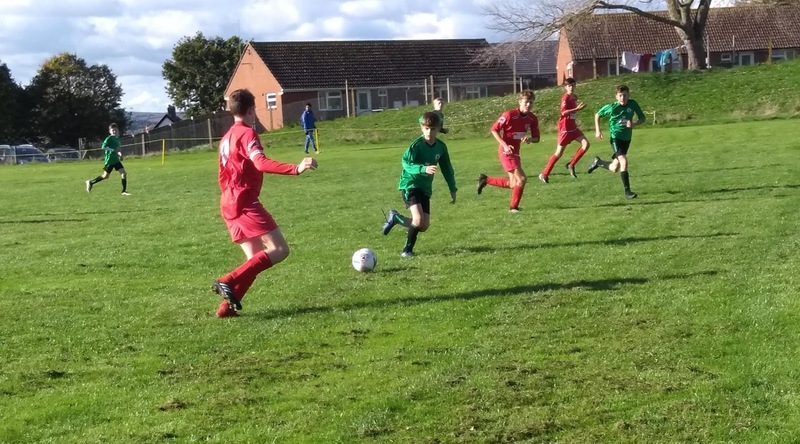 Exmouth United Under 14s started their division 2 campaign with a strong display away to Crediton Youth. United started well, with midfield duo Finn Glanfield and Lewis Evans controlling the game, but after creating a number of excellent chances the score remained 0-0. The deadlock was broken when the quick feet of Cayleb Field bought him a yard of space, and he rifled it home from the edge of the box. Despite their dominance, United found themselves level again after a quick free kick was headed home by the Crediton striker. The away side continued to create chances with some neat diagonal passes releasing Seb Harrison and Tommy Foa on the wings. After coming on for his debut Harry Bowley was soon in the mix with an excellent through-ball that almost produced a goal. At half-time, it remained at deadlock but Exmouth stepped it up a gear in the second half and played some excellent football. A Dylan Mogford corner was struck home by Glanfield to make it 2-1 and Jay Leballeur followed up with a brace to make it 4-1. The attacking wing-backs of United, Tom Price and Harry Bassett, were on fine form pushing the hosts back and there were excellent displays from Bryn Stephens, Patryk Placheki and Daniel Alford. The shot-stopping and distribution from glovesman Lewis Fulls was also very impressive. Website designed and created by Exmouth United FC.